Last month we released the last update for our “spring season” and the team is putting together the plans for this fall (i.e the plans for the next 6 months, which is our internal planning cadence). 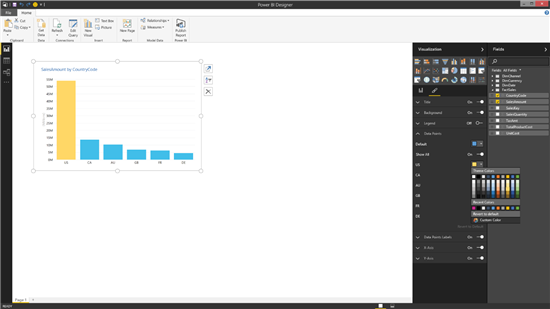 1) Design – we want the Power BI Designer to be the tool that unifies all Power BI client experiences. 2) Users – we want to empower as many people as possible, by removing friction and limitations at each opportunity, and by making Power BI Designer free for everyone. 3) Development – we’re striving for continuous and incremental releases (no more long, multiple year development cycles) that enable us to try out things quickly, and importantly, let us rapidly respond to customer feedback. As we look forward, it’s also a perfect opportunity to look back at what was accomplished, and let us provide a glimpse into what is coming this summer. We love summer in Redmond. “One unified powerful tool, free for everyone, developed in an incremental fashion with customer input”. While many capabilities are still in development, we hope that users can see the direction we are heading, and can experience the progress. Fair to say that it’s a long and humbling process, but we are very encouraged by the feedback and the adoption we’re seeing so far. In this very short period of the Preview, we have seen tens of thousands of users downloading the Power BI Designer Preview and trying it out. We’re also seeing an increased level of usage and sophistication of content created by our users, and the adoption rate of newer builds is accelerating… all signals are pointing to a steady and healthy user base from which we hope to grow. So, what should you expect to see next? The Power BI Designer team is working on our first update for the summer. That update will be significant, and will signal a new phase in our product development. To date we have mostly invested in the modeling and query capabilities, but starting with the first summer release users will see heavy investments in the Data Exploration & Reporting capabilities in the product. While it might be bit premature to go into detail, it’s not premature to provide a teaser… (hey, the Star Wars trailer was released in April for a December screening – I promise we won’t have to wait that long to experience some of the new features!). This is also a perfect opportunity to check-in with our users on how they feel about their experience using the Power BI Designer. While we do gather your feedback and votes yearlong via our UserVoice forum, our research team would like to get your opinions on what works well and what doesn’t work so well. This is not only your opportunity to share your feedback and help us shape the product, but also a chance to enter to win some prizes if you complete the survey by June 18th at 12PM (PST). We will randomly select three survey respondents to each win a $50 Amazon gift card. Winners will be notified by June 18, 2015, and a list of winners may be requested by emailing ucsurvey@microsoft.com after this date. For our sweepstakes rules, please refer to http://www.microsoft.com/usability/uxcsweeps.htm. To be eligible for our sweepstakes, you must complete the survey. You must also be a U.S. Citizen or Permanent Resident with a valid Social Security Number. Only one entry into the sweepstakes will be eligible per person. In accordance with IRS regulations we are required to collect 1099 information (your address and social security number) if the suggested retail value of gratuity items that you select exceeds $599 in a given calendar year. We will not ask you to provide any tax information in this survey, but will contact you before shipping your gratuity item, if necessary. Questions regarding gratuity issues may be directed to ucsurvey@microsoft.com.